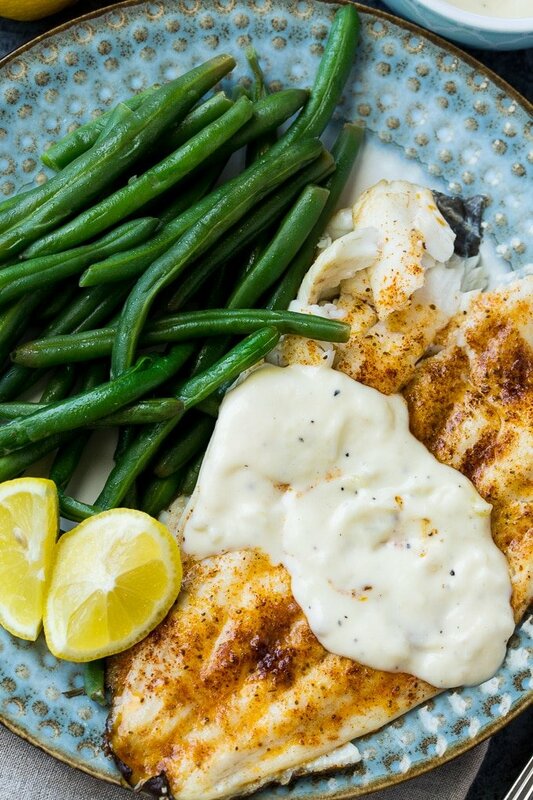 Broiled Flounder with Lemon Cream Sauce makes a quick and easy weeknight meal. It can be ready in under 15 minutes. Flounder fillets are lightly seasoned and then broiled. They are served with an easy lemon cream sauce flavored with garlic. It’s a light meal that’s perfect for summer and warm weather. Finish off the meal with some steamed broccoli or steamed green beans for a healthy meal. 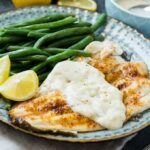 Not only can Broiled Flounder with Lemon Cream Sauce be prepared in just minutes, there’s very little clean-up. 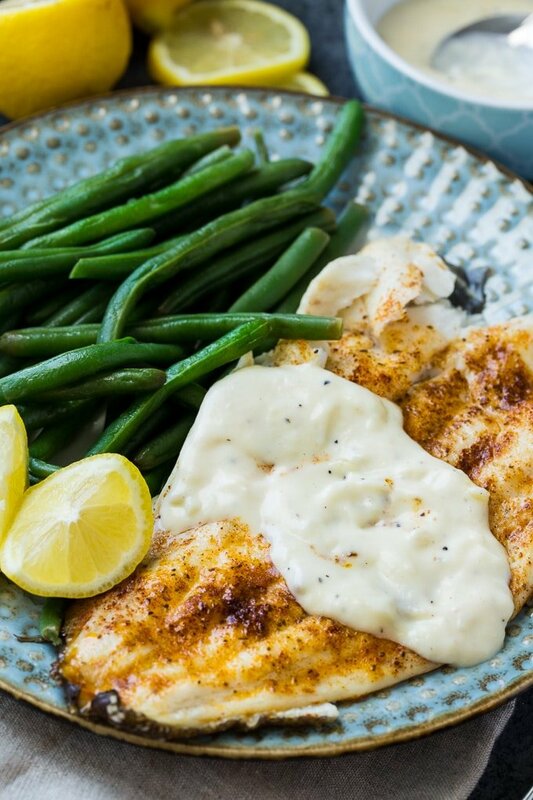 Flounder fillets are brushed with a little melted butter (olive oil could be used instead) and then sprinkled with Old Bay seasoning. If you don’t care for Old Bay or don’t have any, you can use seasoned salt, Cajun seasoning, or even a little paprika and dill along with salt and pepper. Flounder fillets are thin so they only take about 8 minutes to broil. While the fish broils, make a quick and easy lemon sauce in a small saucepan by bringing heavy cream and some minced garlic to a simmer. Then add some fresh lemon juice and butter. Easy peasy! Line a baking sheet with aluminum foil. Preheat broiler. Brush a little melted butter on foil. Place flounder on top, skin side down. Sprinkle with Old Bay and drizzle with remaining butter. Broil for about 8 minutes, or until cooked through. In a small saucepan, bring cream and garlic to a simmer. Remove from heat and whisk in lemon and butter until the butter is melted. Season to taste with salt and pepper. Serve sauce with fish. Note: if you want to thicken the sauce, mix together 1/2 teaspoon cornstarch with 1 teaspoon water and add it to the sauce. Heat until it thickens. This entry was posted in Main Dishes and tagged flounder, seafood. Bookmark the permalink. This was absolutely amazing! I used Sole instead of Flounder and it was restaurant good!!! Thanks for the great recipe.